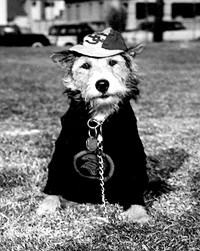 George Tirebiter was originally a scraggly, mixed-breed dog who became student mascot at the University of Southern California in the 1940s. One version of his legend says George wandered onto the university campus after his owner died. Others recall a USC student rescued the sickly, stray dog from a beach in Santa Monica in 1946 and brought him to campus. All agree that he was dubbed "Tirebiter" for his habit of racing alongside passing cars and bicycles while snapping furiously at their tires. In 1947 the USC student body made George their mascot (official? unofficial?). 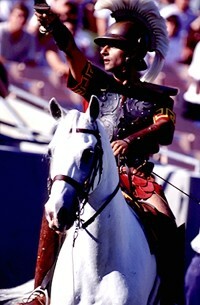 He led the Trojan band onto the field for each home football game often costumed in a sweater and sometimes wearing odd little hats. Tirebiter posed with homecoming queens and at least once drew cheers from the students as he rode in a parade car in the Coliseum. At home football games George Tirebiter is remembered for once biting the mask nose of the rival UCLA’s Joe Bruin mascot (a person dressed in a bear costume). He was dog-napped in 1947 by pranksters from the rival school who shaved his fur to read "UCLA" and covered him with honey and feathers. George Tirebiter was also in the habit of taking daily walks past the house of one David Ossman, who achieved his own fame some 20 years later in a high-IQ, alternate-reality comedy group named Firesign Theatre. 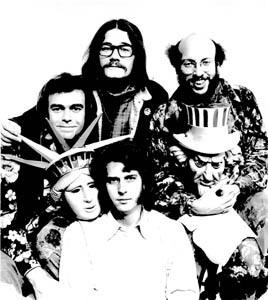 This connection made "Tirebiter" a recurring character in the comedic tapestry of that group, best represented in their classic 1970 recording, "Don't Crush That Dwarf, Hand Me the Pliers". Phil Proctor, David Ossman, Peter Bergman & Phil Austin. and cold rubber recaps for dinner. George Tirebiter I was succeeded by George II for three years (1950-52), George III during 1953 and finally George IV for 1957. USC’s campus bookstore still sells a stuffed version of “George Tirebiter” but the Trojans switched animal mascots to a less interesting horse named “Traveler” in 1961. In 2006 a sculpture dedicated to the original canine mascot was installed on the USC campus, on the “Bloom Walk” at Trousdale Parkway. Thanks for your curiosity. Perhaps someday Tirebiter.com will do more justice to this immortal legend. · The immortal soul of George Leroy Tirebiter, David Ossman.